The lack of reliable measures of alcohol intake is a major obstacle to the diagnosis and treatment of alcohol-related diseases. Epigenetic modifications such as DNA methylation may provide novel biomarkers of alcohol use. To examine this possibility, we performed an epigenome-wide association study of methylation of cytosine-phosphate-guanine dinucleotide (CpG) sites in relation to alcohol intake in 13 population-based cohorts (ntotal = 13 317; 54% women; mean age across cohorts 42-76 years) using whole blood (9643 European and 2423 African ancestries) or monocyte-derived DNA (588 European, 263 African and 400 Hispanic ancestry) samples. We performed meta-analysis and variable selection in whole-blood samples of people of European ancestry (n = 6926) and identified 144 CpGs that provided substantial discrimination (area under the curve = 0.90-0.99) for current heavy alcohol intake (≥42 g per day in men and ≥28 g per day in women) in four replication cohorts. The ancestry-stratified meta-analysis in whole blood identified 328 (9643 European ancestry samples) and 165 (2423 African ancestry samples) alcohol-related CpGs at Bonferroni-adjusted P<1×10-7. Analysis of the monocyte-derived DNA (n = 1251) identified 62 alcohol-related CpGs at P<1×10-7. In whole-blood samples of people of European ancestry, we detected differential methylation in two neurotransmitter receptor genes, the γ-Aminobutyric acid-A receptor delta and γ-aminobutyric acid B receptor subunit 1; their differential methylation was associated with expression levels of a number of genes involved in immune function. 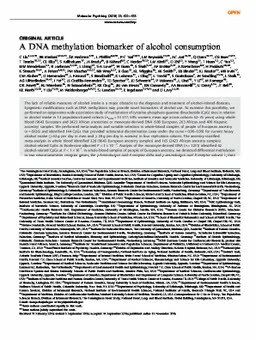 In conclusion, we have identified a robust alcohol-related DNA methylation signature and shown the potential utility of DNA methylation as a clinically useful diagnostic test to detect current heavy alcohol consumption.